Caviart Farms is exceedingly proud of its gold-star team of skilled professionals. This team not only keeps a watchful eye over every horse at the farm, but also diligently follows each horse's schedule for critical services such as insemination, breeding checks, trimming, vaccinations and worming. In a sport where races are won and lost by one-fifth of a second, every team member understands the importance of raising youngsters correctly so that they will become the best that nature intended them to be on the racetrack. 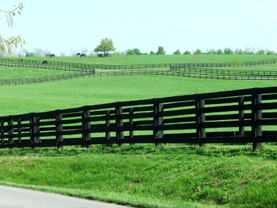 Guiding the day-to-day operation of the farm and heading the on-site team is resident General Manager Terry Chaffee, a Marymount University graduate and fourth generation horseman. Terry grew up around horses and has completed formal training in a myriad of equine related topics and issues. "We are extremely fortunate to have our son, Terry, as General Manager," said Caviart Farms co-owner Buck Chaffee. "Terry grew up in this business and has been around horses since the day that he was born. Not only is he knowledgeable about every aspect of caring for horses of all ages, but he has the instincts that are born into great horsemen." Terry lives on the farm and directs and supervises the work of the farm's horse care and maintenance staff on a daily basis. At the helm of the farm's medical services is Walker J Brown, DVM, a reproduction specialist associated with world-famous Hagyard Equine Medical Institute. Dr. Brown recently was among a team of experts who established quarantine protocol for equestrian events of the summer Olympic Games in Beijing. 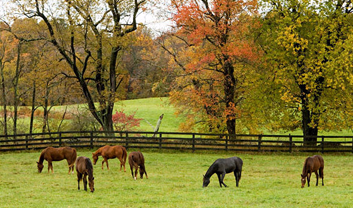 In addition to the fine equine medical care provided by Dr. Brown, Caviart Farms benefits from a close proximity and close relationship with two of the world's leading veterinary clinics - Hagyard-Davidson-McGee Medical Center, and Rood and Riddle Equine Hospital. Both facilities offer speedy access to teams of world renowned veterinarians and the latest in equine medical equipment. Caviart Farms' farrier services are provided by Standardbred specialist Jim Sammons. A well-known expert in hoofcare for horses of all ages, Sammons is also widely hailed for his expertise with youngsters. 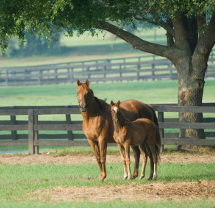 Sammons first evaluates foals on the farm when they are about two weeks old - and then monthly thereafter. Since youngsters grow quickly, their feet, stance and balance can change from month to month - so this expert farrier keeps a close watch on each horse. Should anything surface that warrants attention, he addresses the issue before further problems can develop. Sammons theory is, "The better they stand, the better they race." We agree! "At Caviart Farms, clients and their horses are treated like royalty - which makes my job very easy," explained Judy Chaffee who heads Caviart Farms' public relations and media efforts. A graduate of Marymount University, Judy Chaffee is a former newspaper reporter and magazine writer - with public relations experience for both charitable organizations and a major national hockey team. Additionally, she leads the farm's bloodline analysis and the selection of broodmare purchases and stallion bookings for farm-owned mares. When clients visit or telephone Caviart Farms, their first contact is often with Client Relations Manager Laurie Chaffee, Terry's wife. Always friendly, knowledgeable and helpful, Laurie, a graduate of Florida State University, assists clients with administrative details regarding their horses. "I keep computer records up-to-date, handle a lot of paperwork and make certain that clients receive accurate information regarding their horses."